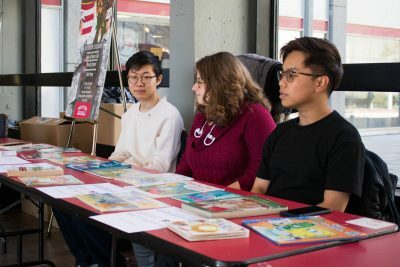 Boston University Domestic and International Relief Efforts held a book drive on Tuesday at the George Sherman Union to collect books for students in need. DIRE will be donating books to both the Sunantha Camila Foundation’s preschool in Colombia for children living in extreme poverty and the More Than Words organization, which is based in Boston. Jeff Valisno, the president of DIRE and a junior in the College of Arts and Sciences, said this is the first event the organization has held, as the club is new. Valisno said he heard about the Sunantha Camila Foundation from his former Spanish teacher at BU and DIRE’s advisor, Martha Castaño. Valisno said any books not for children will be donated to More than Words, an organization that empowers youth. “What they do is they recycle books to help employ teens that are at risk, who are homeless,” Valisno said. Sydney Badger, the vice president of DIRE, said the club has already raised $100 in monetary donations, which can help purchase around 200 books. Badger also said several students who saw the book drive table at the GSU have promised to bring in additional books. “Since spring break is next week and a lot of students are going home, we have given our contact information to a couple students interested in bringing unused books they have from back home,” Badger wrote in an email. What makes the book drive so important, Badger said, is the fact that it allows the BU community to get involved in meaningful causes in Boston and abroad. “Both foundations we have chosen help in different, but important ways — one directly donates books for children to read and enjoy and the other gives books to a youth-run business in an effort [to allow] them to take charge of their own lives,” Badger wrote. Adaline Arnold, a freshman in the College of General Studies, said she appreciates that DIRE’s efforts will help people in both local and global communities. “I like that [DIRE is helping] a global and local area, because a lot of people either work globally and don’t know where their money is going, or only work locally and don’t consider other communities to donate to,” Arnold said. Valisno said three schools in Boston are donating books to the drive from their own libraries. So far, the schools have promised the organization 20 to 25 large boxes of books. Valisno said around five of these boxes will be children’s books. DIRE is also hosting a fundraiser online to raise money to buy more children’s books to donate to the Sunantha Camila Foundation. Valisno, who works with the Boston Health Care for the Homeless Program, said that in the future, DIRE hopes to organize a clothing drive for people affected by homelessness in Boston at the end of the semester. Stephanie Thomas, a freshman in CGS, said she thinks the book drive could be beneficial, but that there might be other ways to help children in need that are more important. Jacqueline Rayfield, a sophomore in CAS, said she is in favor of the book drive.